EPCLUSA® (sofosbuvir 400 mg/velpatasvir 100 mg) tablets | What Is EPCLUSA? 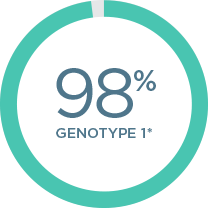 EPCLUSA has an overall cure rate of 98% across all 6 main types of hepatitis C (Hep C). *†‡ Most people take just one pill, once a day for 12 weeks, with or without food.§ Talk to your Hep C Specialist today. 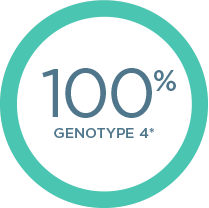 EPCLUSA is from the makers of HARVONI® (ledipasvir/sofosbuvir)—the medicine that revolutionized Hep C treatment for adults with Hep C genotype 1 and has been prescribed to over a half million people. Please see Important Safety Information about HARVONI including Important Warning on hepatitis B reactivation. In a study of 740 patients with genotype 1, 2, 4, 5, or 6 Hep C, with or without prior Hep C treatment, and with or without cirrhosis (compensated), who received either EPCLUSA or placebo for 12 weeks, 98% (323 out of 328) of patients with genotype 1, 100% (116 out of 116) of patients with genotype 4, 97% (34 out of 35) of patients with genotype 5, and 100% (41 out of 41) of patients with genotype 6, who received EPCLUSA once daily for 12 weeks were cured. 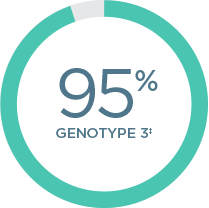 In a study of 266 patients with genotype 2 Hep C, with or without prior Hep C treatment, and with or without cirrhosis (compensated), who received either EPCLUSA or sofosbuvir + ribavirin for 12 weeks, 99% (133 out of 134) of patients who received EPCLUSA once daily for 12 weeks were cured. In a study of 552 patients with genotype 3 Hep C, with or without prior Hep C treatment, and with or without cirrhosis (compensated), who received either EPCLUSA for 12 weeks or sofosbuvir + ribavirin for 24 weeks, 95% (264 out of 277) of patients who received EPCLUSA once daily for 12 weeks were cured. 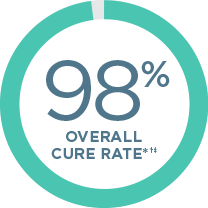 Cure rates for EPCLUSA ranged from 89% (with prior Hep C treatment and with cirrhosis) to 98% (without prior Hep C treatment and without cirrhosis). EPCLUSA with ribavirin is recommended for patients with advanced cirrhosis (decompensated).|| If you take EPCLUSA with ribavirin, you should also read the ribavirin Medication Guide for important pregnancy-related information. Advanced cirrhosis (decompensated) is when the liver is extensively scarred and can no longer do its job effectively. Patients who have both Hep C and HIV-1¶ and patients who have Hep C and advanced cirrhosis (decompensated)|| can be treated for their Hep C with an all-oral EPCLUSA regimen. If you have any questions about your treatment regimen, it is important to talk to your Hep C Specialist. If you take EPCLUSA with ribavirin, you should also read the ribavirin Medication Guide for important pregnancy-related information. It is important to talk with your healthcare provider about your HIV antiretroviral medicine(s) to understand potential interactions with EPCLUSA.